Every now and then I have a chance to review a book on this blog. 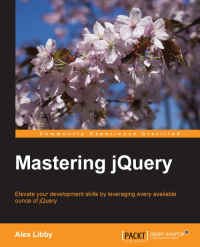 This time it is Mastering jQuery by Alex Libby. I've been using jQuery in my day to day work for years, so when I saw mastering in book title I've approached it with single expectation - to teach me something. Book has about 400 pages of content divided into 14 chapters. Some of them seems to talk about basics (Installing jQuery or Organizing Your Code) while others go for quite specific and advanced topics (Manipulating Images or Using the Web Performance APIs ), but every single one of them hides interesting information. Also despite jQuery being the main theme of the book one can learn a little bit about CSS3 or Node.js - there is even a whole chapter dedicated to Node-WebKit (NW.js). Every piece of knowledge is accompanied by dedicate samples - sometimes even to many of them. On several occasions we will see repetitive examples which show the same technique without visible added value between them. Still the accompanying code is very well organized. Author nicely references the code files which allows him to put only the most relevant source lines into the book, without depriving reader of an easy way for trying the solution he is reading about. Author is using casual language across the book. There is an issue of this casual style going too far in some cases, which makes it feel unnatural. Luckily that unnatural feeling is not strong enough to prevent from absorbing the content. But the thing that was distracting for me is chapters order. For example chapters Animating in jQuery and Using jQuery Effects are separated by Advanced Event Handling which breaks the logical flow. This forced me to jump around chapters a little bit. But this is only a preference and I'm sure it will not be an issue for everybody. The book is a comprehensive source of organized knowledge about jQuery. It managed to teach me a couple of things, what I believe is the most important characteristic of technical book. Reading this book really allowed me for mastering my jQuery skills a little bit more.